There’s only one reason Hawthorne, Nevada exists — and that’s to blow up the world. The town is only ten blocks long and 16 blocks deep, but it’s what surrounds the town that might give you an uneasy feeling as you drive in for the night. The Hawthorne Army Depot is a storage facility for everything that explodes during a war, and it wraps around the town. And while Hawthorne itself is tiny, it still has a few sights worth seeing. Hawthorne is located along US 95, roughly 300 miles northwest of the outskirts of Las Vegas, and 125 miles south of Reno. I must admit, I decided to spend the night in Hawthorne for two reasons. It was a good midpoint between Las Vegas and Lake Tahoe, but also, for some reason about 60 years ago, my father lived here. We visited once in the late 1980’s, but I never got a clear picture of why he chose to live in Hawthorne, Nevada for a couple of years. I certainly didn’t see any reason to spend much time here. If you love Hawthorne, forgive me for saying it, but the town felt sad, and the surroundings were downright spooky. Hawthorne, Nevada is all about bombs. They’re even part of a sculpture garden at the town’s dog park. 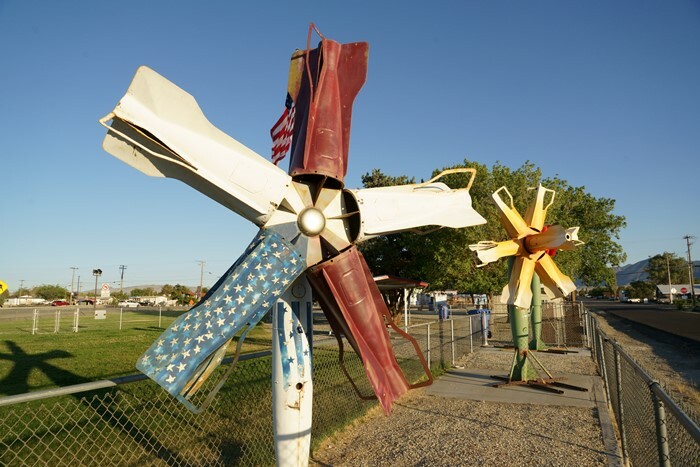 Those pinwheels are made from bomb fins, and they’re perfectly balanced to spin around in the breeze. 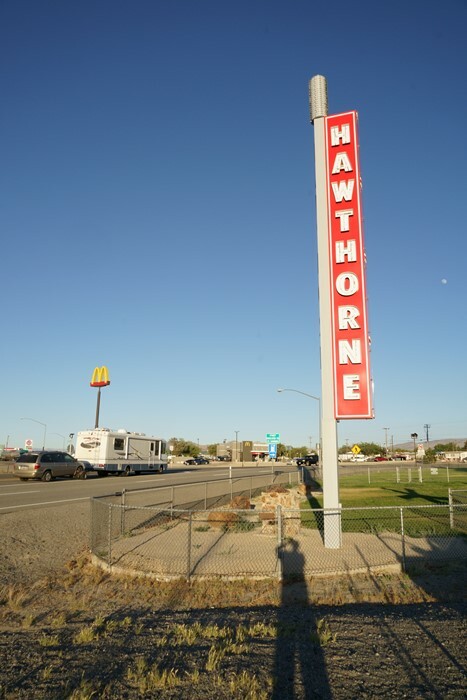 You’ll find them underneath this huge Hawthorne sign at the junction of US 95 and Business 95. Hawthorne isn’t really big enough to justify a bypass, but it wasn’t a good idea to have all of those trucks laden with explosives rumbling through the center of town. That Hawthorne sign, by the way, has been on the corner since the late 1940’s. It used to stand next to the Hawthorne Club, up until 1996 when the club was demolished. Fortunately, the sign survived, and was later modernized. It’s probably the most impressive thing in Hawthorne. 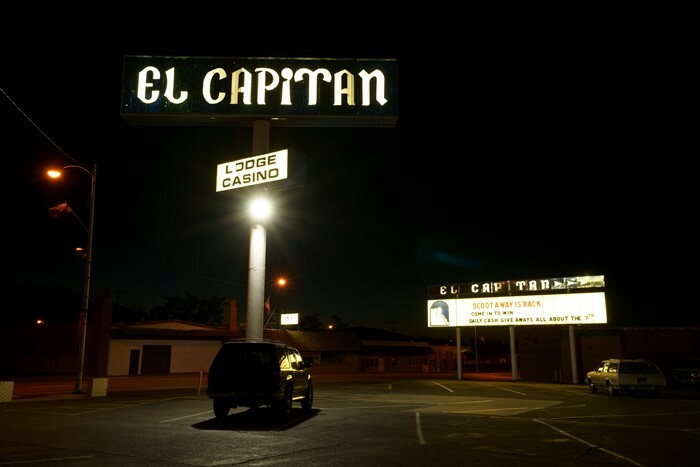 I spent the night at the motel next to the El Capitan Casino. It’s at the center of town, and it feels like the center of activity. But, on this night, as you can see, the parking lot was a ghost town. Are there a lot of conventions in Hawthorne? This is the backside of the El Capitan — or maybe it’s the side, or the front. Each side looked like the back entrance, so I couldn’t tell. 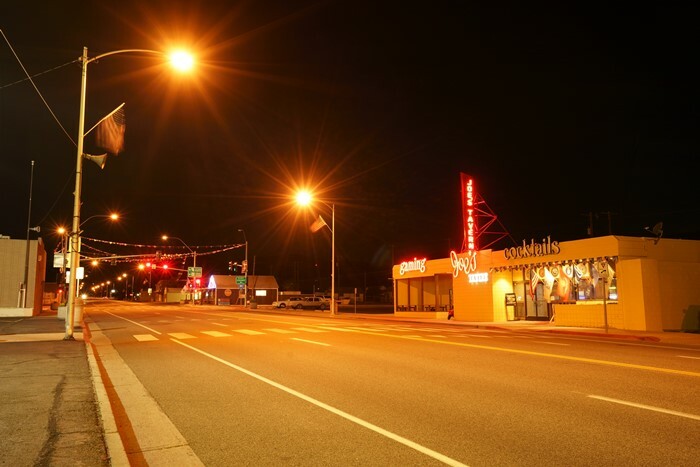 Near the casino, there’s one stoplight in town, at the intersection of US 95 and Nevada 359 – the shortest route over to Yosemite National Park. Across the street is the only other business that seemed to be open and lit-up at night, Joe’s Tavern Casino. 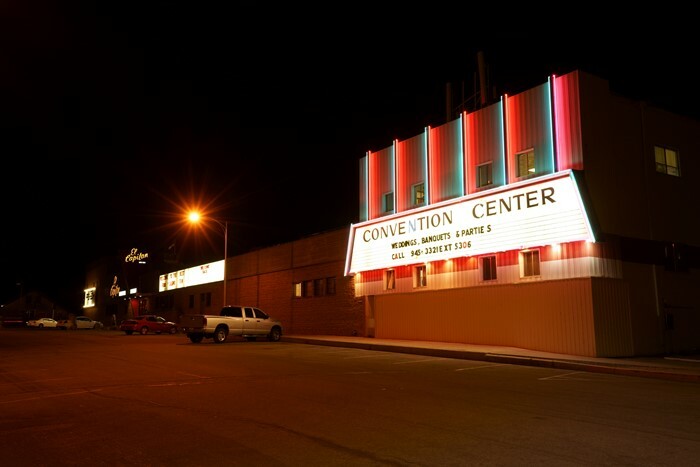 I had hoped that some of Hawthorne, Nevada’s other signs would be lit, but they weren’t. 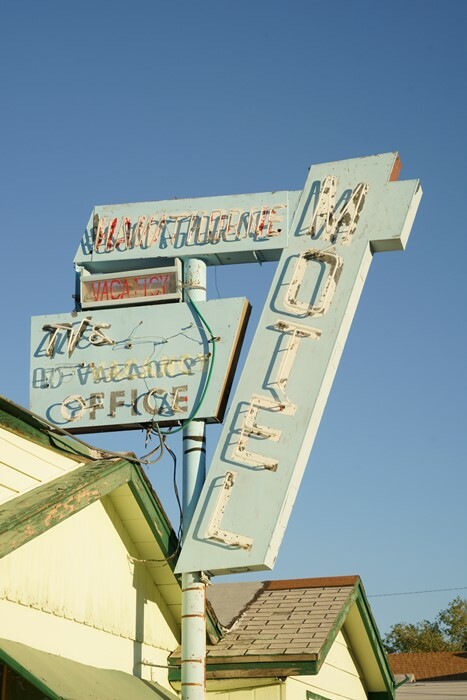 The Hawthorne Motel doesn’t look like it’s in business any longer, and the neon was dark. 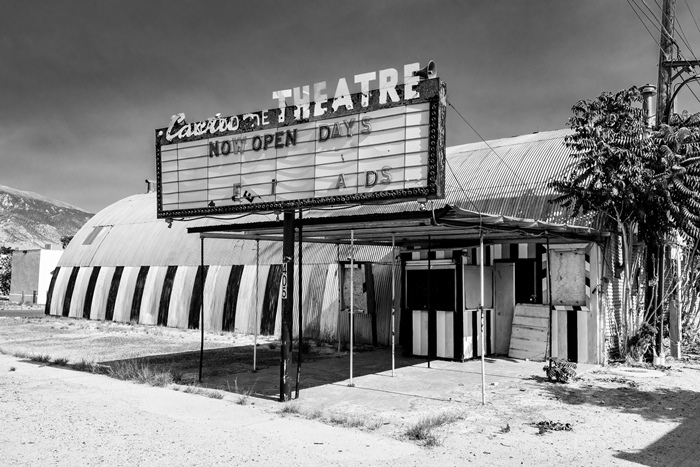 The Cactus Theater, later known as the Cinadome, looks like a scary place to see a movie. Would you want to go in there and turn off all the lights? The Cactus opened in the 1940’s and closed in 1997. Sometime later, it reopened as the Cinadome, but by 2012 it closed again. 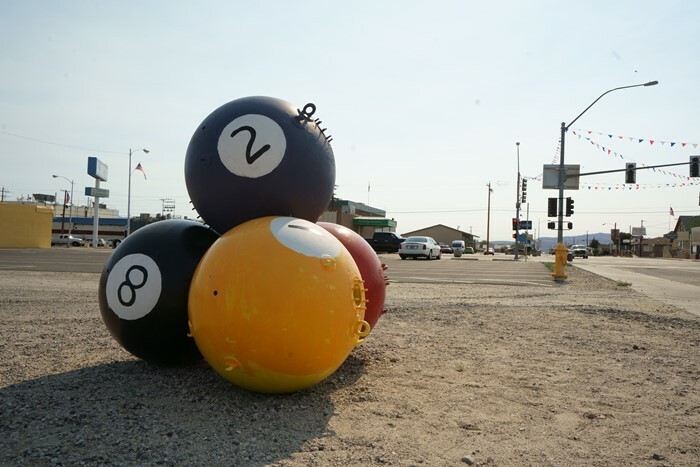 Say what you will about Hawthorne, Nevada, this town has balls! Really big ones, near the traffic light. I have no idea why — but it’s actually a nice effort at public art. 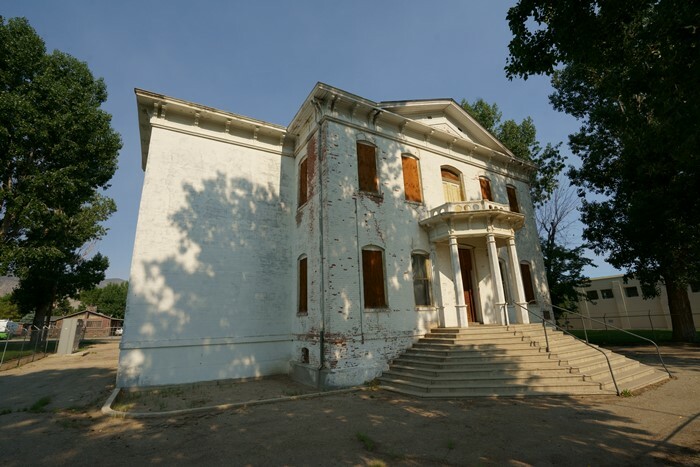 You might also want to check out the old Mineral County Courthouse at 551 C Street. It’s the only courthouse in Nevada that served two different counties — first Esmeralda County until it split, then Mineral. Nowadays, it sits empty behind a chain-link fence. I left town before one of Hawthorne’s biggest attractions opened for the day. You’ll find the Hawthorne Ordnance Museum in a storefront on the corner of E and 9th Streets. Admission is free, and you’ll get to check out all kinds of bombs. No matter where you are in Hawthorne, you’re just a few blocks away from this – miles and miles of bunkers and storage facilities, stretching out to the north, south, and east. This is the Hawthorne Army Depot. During World War II, it was a staging area for the bombs used in the Pacific. It later became a manufacturing facility, and now, a storage facility. During peacetime, it’s only partially staffed, however, it’s still Hawthorne’s biggest employer. The endless rows of concrete structures make you feel very small. 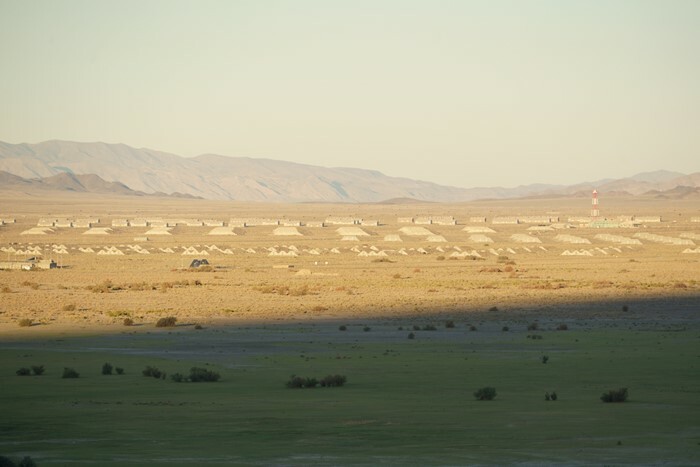 The Army Depot fills the valley, all the way up to Walker Lake, north of town. Signs warn that the area is off-limits, due to unexploded ordinances. You can, however, enjoy a nice view of Walker Lake from US 95. … on my way to Lake Tahoe. 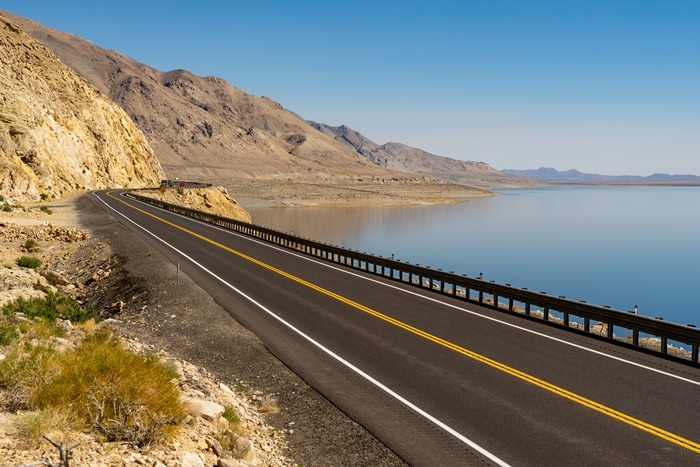 For several miles, US 95 runs alongside the lake, and it’s quite beautiful. 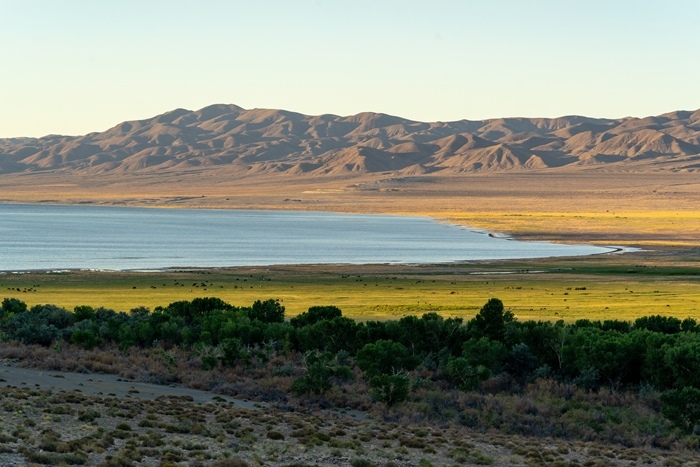 The community of Walker Lake provides a few places to access the water. Hawthorne isn’t the most exciting town you’ll visit in Nevada. Truth be told, I now think I would have rather spent the night in Tonopah, 100 miles away. That said, Hawthorne does have everything you need for an overnight stay, or a quick look around as you drive through. And, its critical role in military history is very interesting.